Each and every software tool has own functionality for users. 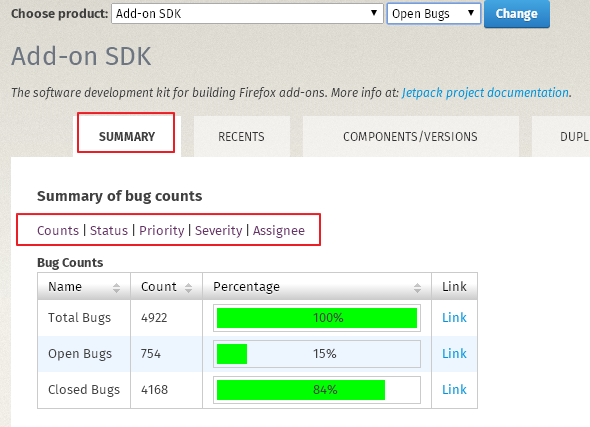 Dashboard is one of the best features of Bugzilla software. We are going to learn this functionality of Bugzilla software. First of all we should know about Dashboard. Dashboard is the combination of different types of objects. All the objective will be displayed on same time, on same screen for compare the objects. This will increase efficiency for the users. In short time period we can compare and came on result about our product status. 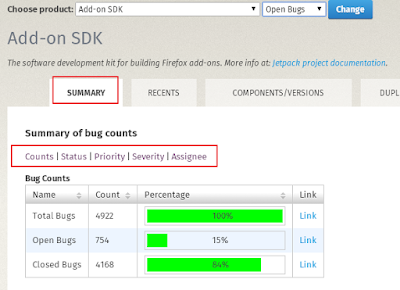 Bugzilla software will display all the information according to your select criteria. Thus, you can compare different types of object easily. Now we will learn about My Dashboard. After clicking on this button ,it will display you information about your work done. You can select your search and save it. According to your entered data it will display you bug, updates, status and summary. You can search component too. You need to enter component in given field. According to image you can review all the details as per your 'choose query'. This is all about My Dashboard. As name suggest it will display all the information regarding to your software product. You can verify here all the objectives related to your projects. Select your project first from Choose product drop down and bug type. You can also update your selection and then you need to click on ‘Change’. This screen has four tabs for displaying all the information correctly as Summary, Recent, Component, Versions, Duplicates, Road Map and Popularity. Summary: After clicking on this tab , it will display information regarding summary of count, status, priority, severity, Assignees of the software product. Count: Bug count will be displayed here with green colored rating. Status: It will display rating of the status for the issues with green color. Priority: Priority if the bug will be displayed here by rating. 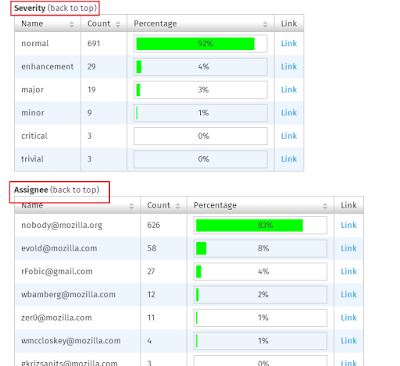 Severity: Severity of the issues will be displayed here with rating. Assignees: Assignment work of the assignees will be displayed here by his work done here. Recent: this tab will display information about recent activity which has been done for the product. You need to enter here dates for verifying change in product. 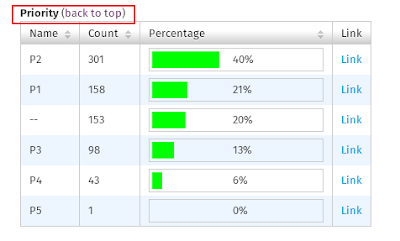 One more functionality is given here as 'Back to Top' button which will navigate you on top of the page after clicking on it. 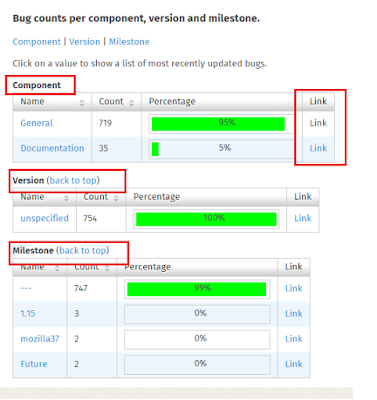 Components/Versions : After clicking on this tab it will display all the bug count for components, versions and milestones for selected product. Verify this in the given image. Bugzilla will display you all the information with green colored rating. Here you can see the 'Link' button. After clicking on this button , it will navigate on the screen where you can find related issue list for selected product. You can verify this from image. Duplicate: After clicking on this tab , it will display you all the information about duplicate issues of the selected product. Verify this from below Image. By clicking on the 'ID number' you can verify all the details regarding duplicate issues. Road Map : After clicking on this tab , it will navigate you to the screen where you can verify Percentage of bug closure per milestone. As per the image , you can verify the records as well as you cam click on links for verify the issue details. Popularity: after clicking on this tab , it will display you 'Most Votes bugs'. You can verify this from the image. Here you can click on most votes issue id and verify all the details for that issues. 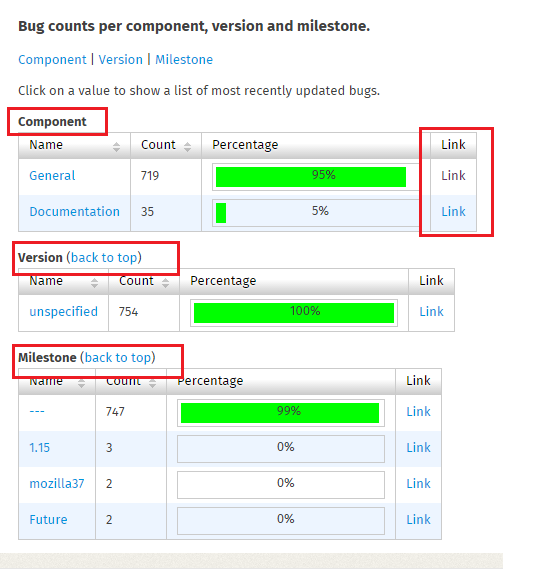 This is all about Bugzilla software product Dashboard. You need to select a product from initial level , afterwords will get all the details by clicking on different tabs which all are describe here.